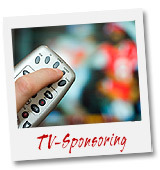 A sponsoring operation on television gives a sponsor the chance to be associated to a TV program and to benefit from the values of the emission, as well as a contextualization of his brand (connected to the editorial line and the tone of the program). Formally, a sponsor could frame the diffusion of the program with a pre- and post-insertion (Billboards), and eventually profit from a mention at every program cut or from an incrustation of his logo during the diffusion. Also a plan of trailers (short spots) can be programmed beforehand to recruit the future audience easier. In February 2017 some rules surrounding sponsoring changed and allowed the presence of the product itself (in contrast to only being allowed to show the brand logo and name before). Even with this less strict rule, sponsoring in television is still a more constraining dispositive than a classic TV spot. Realytics can track a sponsoring operation like a usual media plan. It can automatically detect the diffusion of the billboards and ads. Realytics attributed the contacts that are directly generated after the insertion to each ad insertion (billboard or trailers), meaning: web visits and launch/download of a mobile app. Important: A sponsoring operation is billed globally. Each insertion hasn’t an own value (like a classic spot). The tariff is given for the whole global campaign and not per insertion. Realytics has analyzed 277 campaigns (eligible to the analysis) from 123 advertisers and from these 42 sponsors launched 84 sponsoring campaigns in 2017. The performances pf these sponsoring campaigns were compared with those of 234 classic TV campaigns. From the 42 sponsors, 19 are multichannel distributors and 23 are pure players. If the multichannel advertisers represent 45% of the sponsors, the pure players are more invested in sponsoring (higher volume invested). 90% of advertisers are coming from 4 sectors of activity, in comparison to 60% in the “classic space”: first is distribution, second travel and tourism, then the service sector, followed by financial and insurance institutions. Die age groups are targeted the most: 65% of all TV investments in sponsoring are concentrated on them. In the classic space these target groups are slightly less represented (61%).